You helped me solve Debts Closing Period problem! If more facets of the SSAS/SSDT world were explained like this, the world of data mining would be a much happier place… Thanks! Tried adding a firstnonblank but it didn't work. The DAX I used below only sums the last value for accounts that have records in the pivot date context. Hence, the sum is equivalent to the sum without a derived DAX calculation. If you want the sum outside the PIVOT date context, you will need the pattern for Last Ever Non Empty (link at the end of the blog). It is important to understand the difference between the 4 different patterns and determining which pattern you need for your scenario. Thanks, but how do you do it with DAX? Chris Webb's solution uses MDX. Yeah, when I try his solution I get “table of multiple values was supplied where a single value was expected” even though I have the same data structure, but using accounts instead of stores. The irony is that it's a simple query with T-SQL. You shouldn't get that. Can you paste the DAX formula that you are using (with the way that Javier explained)? Here's the calculation that does work ONLY if I select "year" for the row values. Previously I was using a calendar hierarchy so that makes sense. But I need the lastevernonemptydate (ultimately value) at the day level. Ultimately, I don't need to group it by accounts but I need the aggregate value of all accounts at a daily grain. So the final pivot would have a calendar hierarchy populated with the total balance from all accounts based on the lastevernonemptydate. And then if necessary the specific account could be filtered by using a slicer. Looks like Javier's solution is designed to include the dimension attribute, aka stores, included in the pivot (rows). I think you can avoid the error by putting MAX instead of VALUES (if you are not planning to select a year). I couldn't understand the full requirements from the information that you have given. Which pattern are you looking at – LENE for All stores or Each store? LENE for each store should give you the aggregated value, wouldn't it? That would not need the Stores to be on the Pivot as the SUMX will do it in memory. Thanks, I'll try that and get back to you. Appreciate your feedback! Hi Jason, I did get it to work exactly the way Javier's post explains. However, I still need to get it to work with multiple calendar grains simultaneously, so that I can drag a calendar hierarchy into the pivot and have the aggregated closing balance populated for each day, month, quarter, and year. In any case, really appreciate your feedback since the solution is working the way that you and Javier intended! Hi Jason, I did find a DAX solution (see below) but it only works for a unique date filter. Any thoughts on how to make it work with a date (or date hierarchy) as a row attribute in a pivot? I've read a number of articles about semi-additive measures, but none have addressed the problem I'm facing. Imagine that in your example C1-C4 are customer ans S1-S8 are products. We assume that if a customer has reported inventory for a particular day, any products they did not report on that day have an inventory of zero. So, the total I'd want to see for C3 2011 would be 15, not 25, because we assume S5 had zero stock on Dec 12 2011 due to the reporting of inventory for S6 on that same date. To be clear, the inventory fact table is by product, customer, and date. 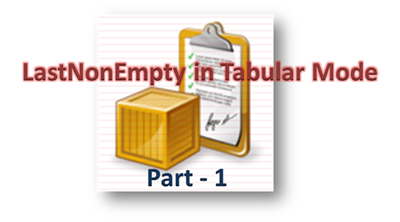 The qty recorded is the inventory balance for the given product/customer/date. The inventory is recorded sparsely, with customers reporting on different dates (some once a week, some twice a week, not necessarily on the same days every week). If a customer has no inventory for a particular product/date, instead of sending a row with 0 qty, they do not send a row. I imagine we could fill in the missing dates in the fact table, but that would severely increase the size of the fact table (this is currently in Excel Powerpivot, not SSAS Tabular). So, I am looking for the inventory qty, per customer & product, for the last day that a customer reported inventory for any product, in the current date context. I would also hope that this measure would sum properly to higher level aggregates (ie: Product Family, Customer Region, Calendar Month). I just came up with this, which is close, but will only show data for an aggregate date period (week, month, etc.) if there is data in the last day of that period. I might have not understood completely, but based on what you say, doesn't option 3 fit what you need? One question I will still have is – how do you differentiate a customer-date combination where inventory was taken that day and inventory was not taken that day? Also, if different customers record inventories on different days, how do you want the total? For eg, if A records on Jan 1, and B records inventory on 2, do you want the inventory on 2 Jan to be A+B (because that is the last known value) or do you still want only A? TLDR; Since we require customers to report at least once weekly, not daily, I should probably limit viewing of inventory to a weekly granularity. And if I'm limiting this to week granularity, then Option #1 still wouldn't work as the C3 2012 value should be none instead of 25, and Option #3 also wouldn't work because C2-C4 2012 should all be none. However, the measure I posted, changed for week instead of day granularity should work fine, or perhaps even something else more simple. Below is my ramblings about this as I through through the problem, maybe they'd be helpful to someone else. Thanks much for asking the questions to get me thinking about this properly. >>Also, if different customers record inventories on different days, how do you want the total? At first I jumped at the answer A+B, but I think I'm now seeing that this is at odds with what I'm looking for at week/month/etc. aggregate levels, as that would cross the current date context of Jan 2. If the lowest granularity was week, the answer would be B, and this is because we require customers to report at least once weekly. Perhaps the measure should function differently depending on how many days are in context…if only one day in context, then open up the date context to the start of the week, but if more than one day in context don't go outside the date context. But that is probably getting overly complicated and I should limit viewing inventory to a weekly granularity, as that is more valuable to the business users. So, the difference between what I need and #3 is that #3 crosses the current date context. In your example the value for C3 2012 is 15 and C4 2012 is 10, I'd want these to be zero since 2011 is not in the 2012 date context. So, you'd think that #1 would be more appropriate. But the difference between what I'm looking for and #1 is that looking across "All Stores" needs to stay bounded by the customer. The values for C1 2012, C2 2012, C3 2012, and C4 2012 all match what I need (10, 25, none, none). But the Total 2012, instead of 10 (C1:5+5), would be 35: (C1: 5+5) + (C2: 25). ie: a sum of the measure values for C1-C4 2012.